A construction worker was killed, while two others sustained serious injuries after the under construction dome at a temple collapsed at New Maya Nagar in Haibowal here today. 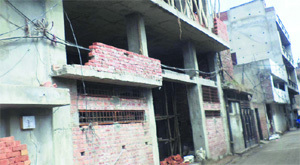 In a blatant violation of the orders of the Punjab and Haryana Court and building bylaws, 16 commercial buildings are being constructed illegally in Zone A of the city. On the directions of the Punjab State Human Rights Commission (PSHRC), the police have booked four members of a family, including a mother-son duo, for kidnapping a woman. In what reflects the poor state of health care facilities, the Civil Hospital does not have an Intensive Care Unit (ICU) for swine flu patients. Though the hospital has a different ward for H1N1 patients, the absence of an ICU has compounded their woes. The Punjab and Haryana High Court has transferred four Additional Sessions Judges from Ludhiana. The court also promoted a Fast-Track Court Judge, working at Ludhiana, as the Additional Sessions Judge, Ludhiana. To ensure that voters don’t face any medical emergency on the day of elections, the Health Department will distribute first-aid kits at polling booths. A team of the Building Branch and Tehbazari Wing of the Municipal Corporation demolished an illegal shed in Model Town today. In good news for the manufactures of cycles in the city, European countries have evinced interest in importing cycles from the country. Control over cops on candidates' agenda? Who is having a better control over the Police Department seem to be the election agenda of SAD candidate Manpreet Ayali and his political rival and independent candidate Simarjeet Bains. The District Congress Committee, Ludhiana, will hold a meeting tomorrow to chalk out the poll campaign strategy of Congress candidate Ravneet Singh Bittu. VMAD (V making a difference), a city-based organisation, under its campaign “I Exist” organised a youth voter awareness campaign at three city colleges - GGNIMT, Ramgarhia Girls College and Gujranwala Guru Nanak Khalsa College. An awareness camp on the participation of youth in the Lok Sabha elections was held at the office of the United Cycle and Parts Manufacturers Association (UCPMA) under the guidance of Assistant Returning Officer Davinder Singh. Hosiery manufacturers in the city are worried about the increase in the prices of acrylic yarn during off season. The manufacturers have to pay Rs 30 more to buy per kg yarn. 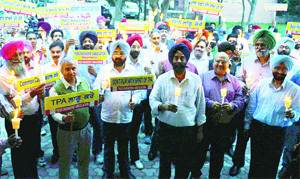 Led by activists of the PSEB Engineers Association (PSEBEA), power engineers held a candlelight march at the central zone office of Punjab State Power Corporation Limited (PSPCL) here today. Although theatre is happening off and on in the city, but plays are not staged here regularly. Unlike Amritsar and Chandigarh, where theatre is frequently organised, young artists and theatre enthusiasts says that support from the government can go a long way in establishing theatre in the industrial hub. Celebrated actor Anupam Kher is all to come to the city to perform in his autobiographical play “Kuch Bhi Ho Sakta Hai”. 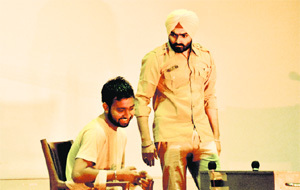 The play, being organised by the Ludhiana Sanskritik Samagam (LSS), would be staged at Guru Nanak Bhawan on April 5. 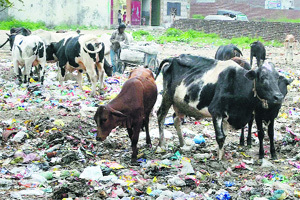 Stray cattle menace is increasingly becoming a cause of road accidents and poses a threat to the lives of the residents. Not only do these cattle roaming on the road prove dangerous to the lives of people, by coming in the middle of the roads, but they also meet their end. The tests conducted on water samples taken from various government schools of the Machhiwara area had found it unfit for consumption. Students here are forced to drink contaminated water. The industrial city with an estimated population of over 25 lakh finds it tough to get respite from the pollution. The only option available for them is the use of public parks. To add to their woes, the condition of these parks seems to be deteriorating day by day. People get perturbed to see the worse condition and find it difficult to stroll and move to get fresh air. An objection was raised by school managements and teachers on a question in Class X board examination paper here today. The Punjab School Education Board conducted Science exam on March 25 in which one of the questions that was wrongly translated created confusion among the students. Harshdeep Kaur of MA (first semester) (Sociology) and Harpreet Kaur of MA (first semester) (Political Science) of Guru Nanak National College, Doraha, topped Panjab University (PU) by securing 83.4 per cent and 82 per cent marks, respectively, the results of which were declared by the PU recently. 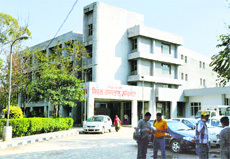 Ludhiana: Students of the Guru Nanak Khalsa College for Women, Gujarkhan Campus, Model Town, Ludhiana, brought laurels to the college by securing 3 first divisions in MA (English) Semester I examination held in December, 2013. 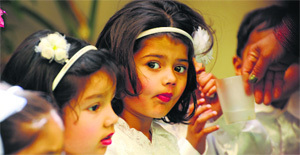 Bhavneesh Kaur scored 66 per cent and stood first, closely followed by Kulvir Kaur who scored an aggregate of 64.25 per cent. Rajdeep Kaur secured the third position by getting 63.75 per cent. The secretary of the college governing body, Gurvinder Singh Sarna and principal Manjit Kaur Ghuman congratulated the students and the members of the faculty for their outstanding achievements. An annual function was organized at St Xavier Playway School, Civil Lines, on Wednesday. The outgoing batch of children presented a colourful entertainment programme that included play- ‘Save Nature’, group song- ‘Aashiyaan’, group dance- ‘Let’s Jump’, Punjabi dance and Punjabiyaan Di Vakhri Pachaan. With no check on the flow of duplicate and counterfeit cosmetics in the city markets, there has been an increase in the cases of skin allergy and reaction among women. A meeting of the governing body of the National Productivity Council was held which was chaired by Amitabh Kant, secretary, Department of Industrial Policy and Promotion (IPP). The governing body elected Ludhiana bases Badish Jindal, Federation of Association of Small Industries of India’s National President as the vice-chairman of the National Productivity Council. The meeting was attended by representatives of industries, labour organisations, local productivity council representatives and senior government officials from the Department of IPP, Ministry of Finance and Planning Commission. A woman ‘cheated’ her husband and kept him in the dark about her previous marriage from which she also has a daughter. The Samrala police claimed to have arrested two youths and recovered 24 bottles of liquor from their custody. 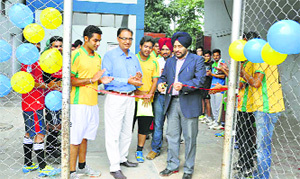 Teams from six medical colleges competed in the Pre-NOZIT Football Tournament organised at Guru Nanak Stadium here today. These include three outfits from Ludhiana and an equal number of teams from other cities.